Today I found out the origin of the phrase “once in a blue moon” and what a blue moon actually is. The first known recorded use of a form of the phrase is in an anti-clerical pamphlet published in 1528 by William Roy and Jeremy Barlowe. In a conversation between two characters, one says, “Yf they say the mone is blewe/We must believe that it is true.” It appears to be a reference to priests at the time making statements and expecting the average person to believe they were true, regardless of how ridiculous the statement was. This is something like the original usage of the “moon is made of green cheese”, in that case referring to the fact that only fools or gullible people would believe that. As stated, in the early days the definition meant something that was impossible or would never happen; it wasn’t until 1821 with the publication of Real Life in London by Pierce Egan that we see “once in a blue moon” meaning “rarely.” In the book, one character says to another, “How’s Harry and Ben? – haven’t seen you this blue moon.” Since then, the phrase has developed into a fairly common saying. But what is a blue moon, anyway? You might have heard that a blue moon is the second full moon in a calendar month. This explanation of blue moons is a relatively modern invention having nothing to do with the original usage of the phrase, mistakenly given in a Sky and Telescope article in 1946. James Hugh Pruett wrote the article, referring to statements given by Laurence LaFleur in a Sky and Telescope column in 1943. LaFleur had been referencing a 1937 copy of the Maine Farmer’s Almanac, but did not make it clear that the Almanac used a tropical year for its definition rather than a calendar year. Still, Pruett’s definition became the most accepted, probably made even more popular by a well-liked radio show in 1980, which used Pruett’s article as a source. 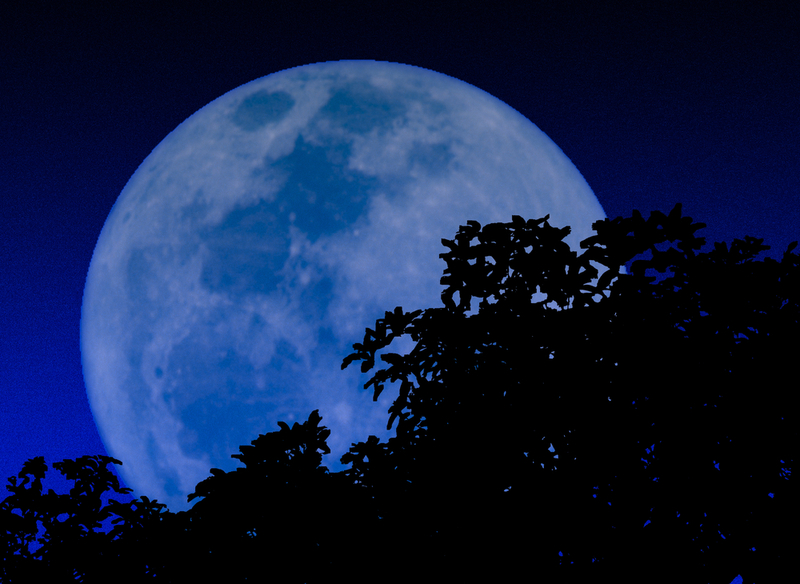 A blue moon, by this definition, happens roughly every three years. The next one is set to occur in July 2015, when there will be a full moon on July 2 and another July 31. However, in 1937—nine years before the Pruett article—the Maine Farmer’s Almanac gave a previous relatively modern definition also having nothing to do with the original phrase, defining a blue moon as “the third full moon in a season of four full moons.” In this case, seasons are split into four equal three-month intervals corresponding with solstices and equinoxes rather than calendar months (also known as a tropical year). As you probably already know, most lunar cycles complete in one month, meaning there are usually twelve lunar cycles every year. However, lunar cycles don’t match up exactly with calendar months. Normally, each of the Almanac’s seasons will have three full moons. Each moon was given its own name. In a season with four full moons, the third one is called a “blue moon” so that the fourth one in a season could be named its proper name in line with the solstice or equinox that it precedes. By this interpretation, blue moons also occur roughly every three years, with the next blue moon predicted to occur in just a couple months, on August 21, 2013. You might be wondering at this point if a moon can ever actually look blue- while usually appearing white, the moon can indeed sometimes look blue, though it has nothing to do with the above modern definitions of “blue moon”. A bluish tinge will sometimes be visible after a volcanic eruption, for instance. The large dust particles in the atmosphere from the ash, specifically slightly wider than .7 microns, will diffract red light, making the moon appear slightly blue and sometimes greenish. This occurred most notably after the eruption of Krakatoa in 1883, when the moon appeared blue for approximately two years in many regions. Reports of blue moon sightings were also made after the eruption of Mount St. Helens, El Chichon, and Mount Pinatubo, as well as after forest fires in Canada in the 1950s. The particles in the atmosphere must be slightly wider than .7 micrometres—that is, wider than red light’s wavelength—with few other sizes of particles in the air in order for the moon to appear blue. Particles of mixed sizes are much more common, but they have a tendency to diffract blue light, which makes the moon appear red. Because of this, red moons are far more common than blue moons, particularly when the moon is on the horizon. It is possible from this that the phrase “once in a blue moon” originally derived from the rare occurrence of the apparent color of the moon being blue, but most etymologists think this is not the case owing to the fact that the phrase originally meant “impossible” or “never” instead of “rarely”, though it’s possible that this phenomenon may have contributed to the morphing of the definition. Blue moons by the Almanac definition will always occur between the 20th and 23rd in February, May, August, or November, roughly a month before a solstice or equinox. By the Pruett definition, New Year’s Eve will fall on a blue moon in 2028, coinciding with a total lunar eclipse. The last New Year’s Eve blue moon happened in 2009. In 1999, there were two full moons in both January and March, but no full moon at all in February. Speaking of blue moons, have you heard of the lavender sun? This phenomenon, where the sun looks to be lavender or blue in colour, is also caused by clouds of ash scattering certain wavelengths of light, similar to a blue moon. “The dark side of the moon” often refers to the side of the moon that can’t be seen from Earth. The opposite side receives the same amount of sunlight, but it’s true that we can only see one side from Earth. Tidal forces on Earth have slowed the moon’s orbit, making the same side face us due to “tidal locking.” The “dark side” (or more accurately, “far side”) is different to the moon we see, with far more craters visible on the surface. There hasn’t been any ground exploration of the far side, but it has been suggested that a radio telescope be placed there because there wouldn’t be any radio interference from Earth. Other moon phrases include “over the moon” (delighted), “to moon over” (thinking about someone), and “shoot for the moon” (to be very ambitious).